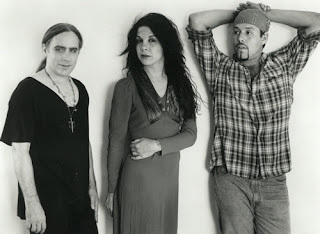 Armed with the indisputably powerful vocals and songwriting of front-woman Johnette Napolitano and an honest, hard-hitting style, LA's Concrete Blonde were one of the most notable bands in early alternative rock. They broke up in 1995 (and again in after a brief reformation a few years ago), but this week announced that they will regroup for a tour celebrating the 2oth anniversary of their most highly-regarded record, Bloodletting, with a Chicago stop on Saturday, June 12 at the Vic. The show will celebrate the excellent LP with a setlist that will presumably include all 10 tracks, including "Joey," the band's most successful single, as well as other fan favorites such as "Tomorrow, Wendy," "Bloodletting (The Vampire Song)" and "Caroline." It is one of 13 dates on the tour, with other stops covering New York, Texas, California and more. Click here for a full list. Tickets for the Chicago show go on sale here this Saturday, April 17 at 10 a.m. I MISS THIS BAND SO MUCH!